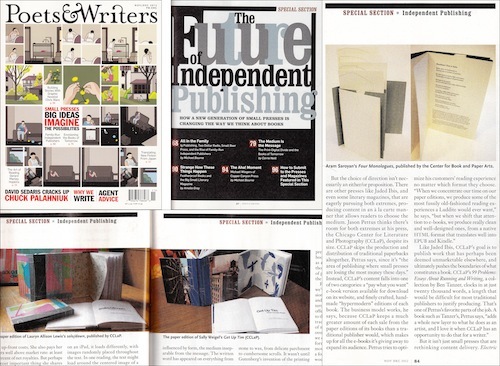 Second year Book and Paper MFA Alex Borgen was recently nominated for the South Loop Green Hero Award. This honor is given each year by the Alliance for a Greener South Loop to a South Loop resident within the boundaries of Van Buren to Cermak and the Chicago River to Lake Michigan whose personal commitment to a green lifestyle makes an impact in the community. 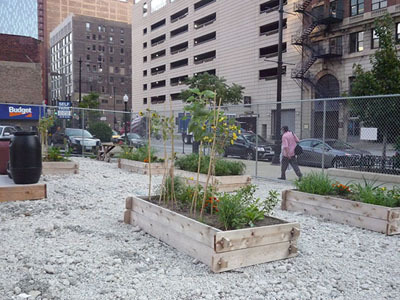 Alex Borgen has been nominated for her work on the new Papermaker’s Garden, at 750 South Wabash Avenue. Borgen originally proposed the idea as a collaborative and cross-disciplinary space for discovery and learning that would also contribute to Columbia College’s green initiative by producing fiber suitable for use in paper making. Her proposal is supported by Columbia’s Office of Campus Environment, the Office of Academic Affairs, the Interdisciplinary Arts Department, the Center for Book and Paper Arts, and the InterArts graduate student group Pulp Ink and Thread as an ideal way to provide a new green space in the neighborhood. This year’s fourth Annual Greener Awards Celebration Event will be held on Thursday, November 29 at 6:00 p.m., at Roosevelt University, 425 S. Wabash, Room 418. The general public is invited to come honor the nominees and the winner and enjoy refreshments. Those who arrive by 5:15 p.m. will be given a tour of Roosevelt University’s just-certified LEED Gold building. The tour will be followed by the announcement of the winner from the many nominees, and a panel discussion entitled “The Journey of Going Greener.” R.S.V.P.s are requested for all who plan on coming to cheer Alex on. Nominees, and students showing IDs will be welcome guests. A $10 donation is requested for all other attendees to help support this Alliance event. 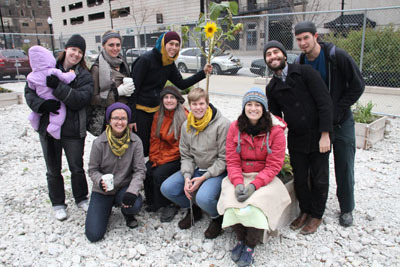 Alex Borgen, here with sunflower and fellow MFA students, at the recent winter preparations in the Papermaker’s Graden.